Everyone has a gaming-ready device in their pocket today. In fact, of the one billion Android users in more than 190 countries, three out of four of them are gamers. This allows game developers to reach a global audience and build a successful business. Over the past year, we paid out more than $7 billion to developers distributing apps and games on Google Play. At our Developer Day during the Game Developers Conference (GDC) taking place this week, we announced a set of new features for Google Play Games and AdMob to power great gaming. Rolling out over the next few weeks, these launches can help you better measure and monetize your games. Google Play Games is a set of services that help game developers reach and engage their audience. To further that effort, we’re introducing Player Analytics, giving developers access to powerful analytics reports to better measure overall business success and understand in-game player behavior. Launching in the next few weeks in the Google Play Developer Console, the new tool will give indie developers and big studios better insight into how their players are progressing, spending, and churning; access to critical metrics like ARPPU and sessions per user; and assistance setting daily revenue targets. BombSquad, created by a one-person game studio in San Francisco, was able to more than double its revenue per user on Google Play after implementing design changes informed during beta testing Player Analytics. Native Ads: Currently available as a limited beta, participating game developers will be able to show ads in their app from Google advertisers, and then customize them so that users see ads that match the visual design of the game. 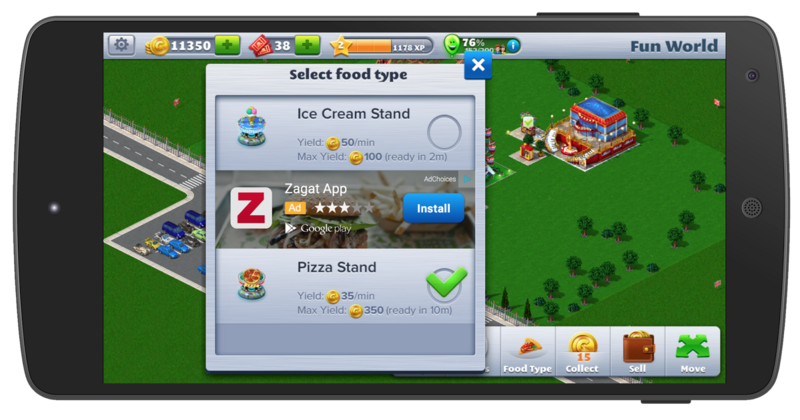 Atari is looking to innovate on its games, like RollerCoaster Tycoon 4 Mobile, and more effectively engage users with this new feature. In-App Purchase House Ads Beta: Game developers will be able to smartly grow their in-app purchase revenue for free. AdMob can now predict which users are more likely to spend on in-app purchases, and developers will be able to show these users customized text or display ads promoting items for sale. Currently in beta, this feature will be coming to all AdMob accounts in the next few weeks. Audience Builder: A powerful tool that enables game developers to create lists of audiences based on how they use their game. They will be able to create customized experiences for users, and ultimately grow their app revenue. "Atari creates great game experiences for our broad audience. We're happy to be partnering with Google and be the first games company to take part in the native ads beta and help monetize games in a way that enhances our users' experience." Last year, we launched Android TV as a way to bring Android into the living room, optimizing games for the big screen. The OEM ecosystem is growing with announced SmartTVs and micro-consoles from partners like Sony, TPVision/Philips and Razer. To make gaming even more dynamic on Android TV, we’re launching the Nearby Connections API with the upcoming update of Google Play services. With this new protocol, games can seamlessly connect smartphones and tablets as second-screen controls to the game running on your TV. Beach Buggy Racing is a fun and competitive multiplayer racing game on Android TV that plans to use Nearby Connections in their summer release, and we are looking forward to more living room multiplayer games taking advantage of mobile devices as second screen controls. At Google I/O last June, we also unveiled Google Cardboard with the goal of making virtual reality (VR) accessible to everyone. With Cardboard, we are giving game developers more opportunities to build unique and immersive experiences from nothing more than a piece of cardboard and your smartphone. The Cardboard SDKs for Android and Unity enable you to easily build VR apps or adapt your existing app for VR. Visit us at the Google booth #502 on the Expo floor to get hands on experience with Project Tango, Niantic Labs and Cardboard starting on Wednesday, March 4. Our teams from AdMob, AdWords, Analytics, Cloud Platform and Firebase will also be available to answer any of your product questions. For more information on what we’re doing at GDC, please visit g.co/dev/gdc2015.